Puerto Rico’s debt restructuring is in a strange form of limbo. Puerto Rico’s oversight board is currently on life support. It is waiting to see if the Supreme Court takes up its appeal to the PROMESA appointment case. The appellate court concluded that the members of Puerto Rico's Oversight board need to be confirmed by the Senate, but upheld the rest of PROMESA (the law setting out Puerto Rico's debt restructuring process) and the board’s existing decisions. And even if the current board selection process—modeled on the process used to pick the DC control board—is ultimately upheld, the clock is ticking: the current board’s three year term runs out at the end of the summer. And at least for now the process for restructuring Puerto Rico’s bonds also seems stuck. The restructuring of one the important groups of bonds—the sales tax backed bonds—is now complete. Debt service on those bonds can be penciled in for the next 40 years or so. The question is now how much to pay everyone else. And that hinges in part on forecasting Puerto Rico's future economic trajectory. 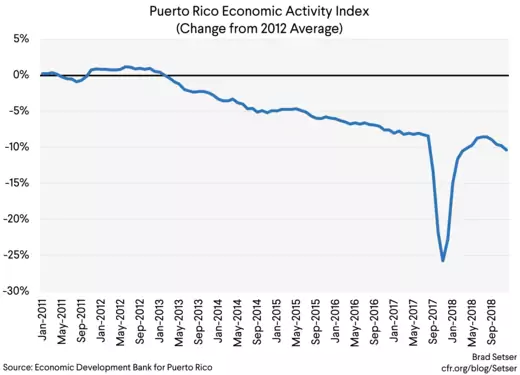 Puerto Rico’s economy looks to have performed reasonably well in 2018. But it should be doing well—2018 is the year when Puerto Rico bounced back from the worst of Maria. The board is expecting output to jump something like 20 percent over baseline over the next few years thanks to the stimulus provided by federal funds. That increasingly seems too optimistic. 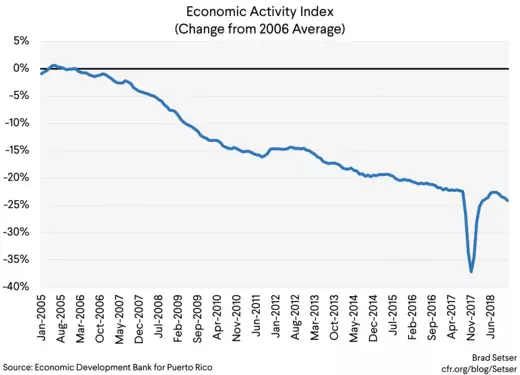 ** Puerto Rico's Economic Activity Index stalled the last half of 2018. 2019 tax revenue growth also hasn't been especially robust, but, well it is hard to get a clean read because Puerto Rico has changed its accounting system (consistent time series are not a strength of Puerto Rico; see footnote d about "other state collections" on p. 9). Puerto Rico is currently running a cash surplus thanks to the extra Medicaid funding Congress provided and the influx of tax revenues associated with federal disaster spending (contractors are reporting income in Puerto Rico, so corporate tax collections are up), so the real question is future not current payments capacity. Right now, though, there isn't much basis for long-run optimism. Puerto Rico's demographics aren't favorable, and output was trending down before the hurricanes. Future revenues aren't likely to be much higher than current revenues. That makes the debt restructuring essentially a decisions about how much of Puerto Rico's future tax base to pledge to different categories of bonds. There are three broad groups of tax-supported bonds—the sales-tax backed bonds, the “constitutional” GO bonds, and the legally complex set of smaller claims that are considered junior to the GOs. In some ways, the already restructured sales tax backed bonds (COFINA) were the most important of the lot. They had a direct claim on a portion of Puerto Rico’s tax base (there was a question about the constitutionality of that claim, which got resolved as part of the restructuring). And because of the insidious structure of the capital appreciation bonds, the burden on the COFINA bonds was set to rise. Let me step back. COFINA consisted of two distinct sets of bonds: the current interest bonds, and the capital appreciation bonds (the municipal bond market's version of zero coupon bonds). Before Maria, Puerto Rico was paying interest (at around 5.5 percent) on $12 billion or so of COFINA current interest bonds. But over time the COFINA capital appreciation bonds would mature, and thus total payments on the sales-tax backed COFINA bonds would rise from around $0.7 billion a year (1 pp of GNP) to $1.8 billion a year (around 2.5 pp of GNP, a sum that would essentially take up all of the 6 percentage points of Puerto Rico's sales tax pledged to back the bonds; in fact, it could have exceeded the pledge had Puerto Rico's economy continued to decline). Because of this structure, the burden created by the unrestructured COFINA structure was far larger than it seemed. And so too is the burden created by the agreed restructuring, as payments on the new COFINA bonds rise steadily over the next twenty plus years. 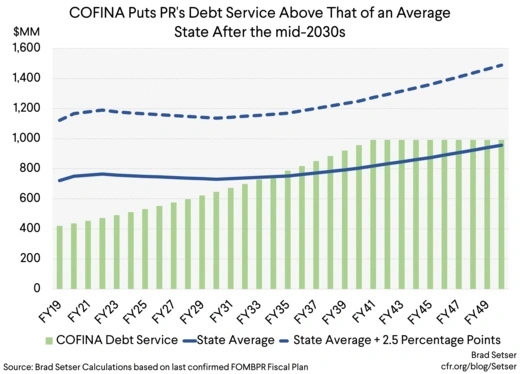 Even after the restructuring, payments on the COFINA bonds would put Puerto Rico's debt burden (judged relative to its revenue) above that of an average state. 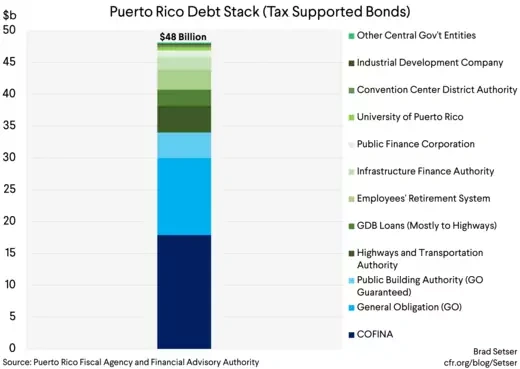 And COFINA is only a portion of Puerto Rico's debt stock. In addition to the $10 billion in new COFINA current interest bonds and the $2 billion in capital appreciation bonds, Puerto Rico has around $30 billion in other unresolved claims on the commonwealth outstanding. A little over half of that is the $17 billion in constitutional and constitutionally guaranteed debt (including the PBA bonds; see Nuveen). And then add in the highway bonds, the pension obligation bonds, the public finance corporation bonds, the rum bonds (my personal favorite), the University of Puerto Rico bonds, the convention bonds, and the loans the government in theory owed the government development bank. Before the COFINA restructuring, total debt service supported by the commonwealth’s taxing power was around $3 billion a year (with roughly $2.25 billion in interest—think of a 5 percent coupon on just over $40 billion of "current interest" debt—or think $700 million of interest on the old COFINA bonds (now reduced to $450 million, but it will step up), just under a billion on the GO and GO guaranteed bonds, and $500 - 600 million on the more junior bonds; the tables on pp. 26-27 of the 2017 fiscal plan remain the best source). That’s large relative to Puerto Rico’s “own” revenues. Federal funds are for particular purposes, they are generally left out of calculations of a sustainable level of debt service for states. That's relatively high actually. Mississippi has a similar population (around 3 million) and it only collects around $6 billion in tax revenue (see Mississippi's debt affordability study). The trick here is that about $2.5 billion of Puerto Rico's current tax revenue isn’t really paid by Puerto Ricans. Act 154 and the non-resident withholdings tax are paid primarily by the multinational companies (Big Pharma and Microsoft) that are currently tax residents of Puerto Rico (Act 154 probably shouldn’t be deductible from federal corporate income tax, but for now it still is). If you throw in all of the other revenue sources available to the commonwealth—from selling lottery tickets to medical co-payments to mandatory pension contributions from local government employees—you get about $15 billion in revenues. The board estimated future revenues in the $16-17 billion range. I personally might pick a lower number—I am not sure that medical fees for example should count toward revenue available for debt service. The key question then becomes how much of that should go to debt service. The state average for debt service to the state's revenue is 4.5 percent. New York pays 8.1 percent, but New York is a fairly rich state. Mississippi (according to Moody's, in fiscal 2017) pays 7 percent and its per capita income would put it closer to Puerto Rico. That seems like a useful benchmark. Applying the range defined by the average state on the low end and Mississippi on the high end to Puerto Rico together with the board's estimate for Puerto Rico's revenues gives annual payment capacity of between $800 million and $1.25 billion over the next twenty-five or so years (the board has revenue growth accelerating after 2040; I would use a more conservative baseline for any base bond). The math here for non-COFINA bonds is brutal. 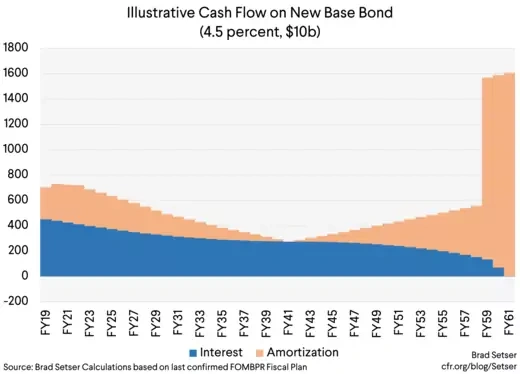 The new COFINA bond alone will leave Puerto Rico with a projected debt burden above that of an average state from 2035 on. 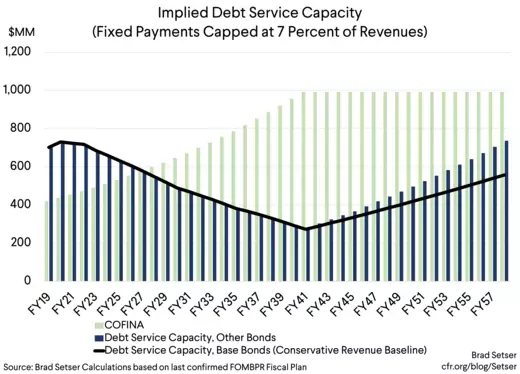 With 6 percent of projected future revenues pledged to COFINA after 2040 or so , Puerto Rico can only pledge 1 percent of its future revenues (200 million a year, roughly) to other bonds and keep overall debt service under 7 percent of projected future revenues in the 2040s. There is a lesson here for the rest of the municipal bond market; the GOs should have sold off as more and more sales tax backed bonds were issued. There are some technical tricks that the board could and should try in order to get a bit more space to carry out a consensual restructuring—the new capital appreciation bonds that are part of the new COFINA structure trade at a discount, so buying them back or doing a swap into the current interest bonds can reduce the scope of the revenues pledged to new COFINA. And if Puerto Rico’s future revenues outperform expectations, a portion of that out-performance could go to the bond holders (I would say this portion should be around 7 percent, so as not to raise the debt service to revenues ratio, but that’s for the negotiations). But there is a case that even this is too generous. If you use debt per capita rather than debt service relative to revenue as your benchmark for what Puerto Rico should pay, Puerto Rico's debt stock shouldn't exceed $12 billion or so (The average for the ten most indebted states is $4,000 per person: Mississippi is worried about $2000 in debt per resident; the top end of the state range is 6,000 per person. See exhibit 24 on p. 37 of the October fiscal plan) and there are already $12 billion in new COFINA bonds outstanding. Puerto Rico's current population is around 3.2 million, but that number is expected to fall over time (absent in-migration, Puerto Rico’s population will decline over time thanks to its built-in demographics). So what are the choices available to a future board? One is to do what the math, and President Trump, has demanded, and look for a steep haircut on the GOs and the junior bonds, sweetened by a bit of upfront cash. Remember that the fundamental risk of a high debt service to revenues ratio is that the revenue base will disappear. Taxes support government services. But if the bulk of revenues are going to pay off legacy debt, well, there will be a permanent wedge between what Puerto Ricans pay in tax and what they get back in return. And if that ratio becomes unfavorable, Puerto Ricans can migrate to a state—and take Puerto Rico’s projected tax base with them. Another is to basically throw away the state comparison***** and allow Puerto Rico to pledge far more of its projected revenues to bond holders, particularly in the near-term. The projected short-term budget windfall from disaster aid, for example, could all go to the bonds. That would look a bit like a federally financed bailout of Puerto Rico’s creditors, but, at the end of the day, the board has a lot of power to determine what constitutes a sustainable debt burden. And the third? Juice the forecast—and count on a future economic boom to generate more revenue. The problem here is that such a forecast lacks credibility—Puerto Rico was in a sustained slump before Maria, its biggest industry and biggest source of tax revenue (pharma manufacturing) could be damaged by future reforms to federal corporate income tax and its demographics aren’t favorable (Puerto Rico will grow old before it grows rich). And well Puerto Rico’s current recovery is clearly a function of a temporary influx of federal dollars—pledging large sums to bond holders after those funds are used up puts Puerto Rico at risk of more or less falling back into bankruptcy. The choices are hard, no doubt. But they are choices that the board—whether it’s the current board or a new board—cannot avoid. * The current board is composed of two members selected off a list provided by the leader of the House, two off a list provided by the leader of the Senate, and one each by the presidents and the minority leaders in the House and Senate. ** The board is modelling each year's federal disaster aid spending as incremental new stimulus (while the impact of previous years federal spending fades). I think that overstates its impact. If the federal government provides $2 billion a year over 6 years, I would view that as a $2 billion (3 percent of GNP) annual stimulus that will raise output by around 4 percent of GDP (relative to baseline, with the board's 1.3 multiplier) until it goes away, not as $12 billion of stimulus. I personally would use a higher multiplier for federal aid, but the impact of the higher multiplier is dwarfed by the methodological difference. The peak impact of federal disaster aid also keeps getting pushed back: it isn't now expected until the early 2020s. *** On the surface it would seem like Puerto Rico should be able to collect more individual income tax than an average state, given the absence of a federal income tax. But the federal income tax structure is quite progressive, so replicating it actually doesn't generate much revenue in a territory as poor as Puerto Rico. If Puerto Rico had an EITC of its own comparable to that of the federal tax code, its personal income tax would generate less than $1 billion. The big tax take has come from the "controlled foreign corporations" (big Pharma and Microsoft) operating on the island for tax reasons. **** To make everything concrete, I computed the funds that are available to settle with all of the remaining bond holders after the COFINA settlement while keeping debt service to seven percent of revenues, and worked out the payment profile of bonds that would "fit" inside that envelope. Payments by design go down from now until 2040-44 in order to offset the step up in COFINA payments. And then the payments step up in the late 2050s after the COFINA capital appreciation bonds have been paid back. I also used a slightly more conservative revenue baseline from 2040 on than the board does; I didn't assume that revenue growth accelerates over time. That's because over-estimating future growth is a classic way countries get into trouble—and in my view Puerto Rico would offer a realistic payment profile on the fixed base bond and use revenue warrants to give creditors a reasonable share of any future revenue out-performance. Also note that this bond would put Puerto Rico's debt per capita above that of the most indebted states; it almost certainly is an upper bound on what Puerto Rico can afford. ***** The state comparison of debt to state GDP (GNP in Puerto Rico's case) suggests even less debt service capacity than debt service to own revenues. A 10 percent debt to state GDP ratio is high—and that puts Puerto Rico's sustainable debt at under $10 billion. New COFINA alone is above that.